As reports of the spreading Swine Flu outbreak fill news channels and the government declares a National Health Emergency, how refreshing that Barack Obama is on top of things, swinging his golf club. Where is his reassurance to the nation that steps are being made to curtail the outbreak? Or, “the only thing we have to fear is fear itself” speech? President Bush was continually under fire for not preventing Hurricane Katrina, not usurping Democrats in Louisiana to bring relief to those affected, for reading to children in Florida when the 911 terrorists struck and not being immediately on TV to quell fears and such all throughout his presidency. Yet, as warnings of a potential pandemic of Swine Flu spreads across our TV screens, Obama chooses to play golf and no outcry over his apparent lack of concern or inability to lead the nation through a potential crisis. Then again, he may just be really tired from spending all of our hard earned money and pushing for tax increases and firing corporate CEO’s to nationalize business, take over banks, dictate what cars will be built and available for sale and such. Setting oneself up to be dictator can be tiring, I suppose. Since the outbreak is mostly in Mexico, where is the sealing of the borders to those entering illegally? Why aren’t flights from Mexico being tested for the flu strain, as other countries have began doing? The Center For Disease Control tells us it may be too late to contain the flu outbreak. Americans have been urged to wear masks. 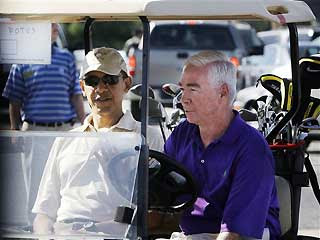 And Barack Obama rides around on a golf cart!